The Sisterhood began discussing their fiftieth anniversary in January 1955, but planning began in earnest in August and September. One of their earliest steps was to send out letters to local and out-of-town members, alerting them to the event and soliciting ads and greetings for this souvenir booklet (scanned at the end of this post, followed by a transcription). Another early step was ordering custom pins for all their past presidents who didn’t already have one. Attending the dinner cost $5 per plate, with no further solicitation to take place during the dinner. The program included a play which they rehearsed for two months. The decorations were white and gold, perhaps to coordinate with the new tablecloth which covered the speakers’ table. Guests ate chopped liver, relishes, ¼ roast chicken, mixed vegetables, farfel, “pineapple + cr sauce” (not sure what this is), pastry, tea, and rolls, and they took home as souvenirs the booklet scanned below, a small bottle of wine, and a key chain. The dinner was a huge success. 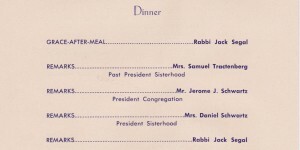 With a net profit of $1005.67, it far exceeded any event at the shul from the period for which there are records. Afterwards, four pictures from the dinner were framed and hung in the synagogue’s vestry room. Anyone have any idea where these went?! 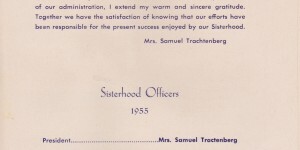 This program was saved by Florence Stahlberg Hiedovitz, who joined the Sisterhood in early 1951, and was shared with me by her daughter, Caren Lever — and thank goodness they were so preservation-minded! 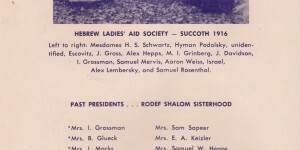 As you’ll see, this program is a wonderful record of the community, including the priceless photo of the Hebrew Ladies’ Aid Society (as the Sisterhood was then called) in 1916. Left to right: Mesdames H.S. Schwartz, Hyman Podolsky, unidentified, Escovitz, J. Gross, Alex Hepps, M.I. Grinberg, J. Davidson, I. Grossman, Samuel Mervis, Aaron Weiss, Israel, Alex Lembersky, and Samuel Rosenthal. In 1905, a small, energetic group of women joined in a philanthropic crusade to help the survivors of the Kishinef Massacre. 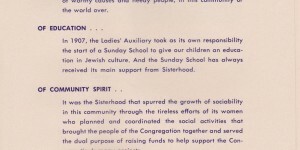 1 To be sure, in 1905 the organization was known as the Ladies’ Auxiliary of Rodef Shalom. But never once in a 50 year history has the Sisterhood failed in its support of worthy causes and needy people, in this community or the world over. In 1907, the Ladies’ Auxiliary took as its own responsibility the start of a Sunday School to give our children an education in Jewish culture. And Sunday School has always received its main support from Sisterhood. 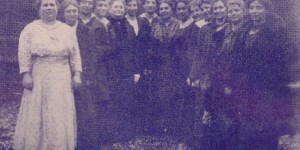 It was the Sisterhood that spurred the growth of sociability in this community through the tireless efforts of its women who planned and coordinated the social activities that brought the people of the Congregation together and served the dual purpose of raising funds to help support the Congregation’s many projects. 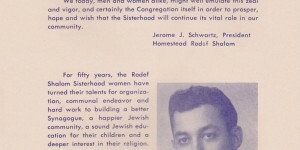 And by following so conscientiously, through 50 years, the fundamentals of philanthropy, education and community spirit, the Homestead Rodef Shalom Sisterhood has served honorably and unselfishly the cause of religion. More than that, it has furthered the cause of the young, the aged and the Synagogue and so has maintained and nurtured the most basic principles of Judaism. 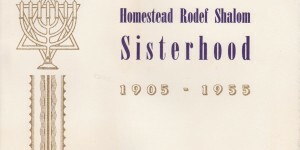 The past fifty years will stand out as a period of tenacious effort and dedication of the principles and ideals of the Homestead Rodef Shalom Sisterhood. A great progress has carried us forward in Philanthropies, Jewish Education, Religion and Communal endeavors. As we pass this momentous milestone, encouraged by our past achievements and strengthened by the worthiness of our program, we pledge to continue to work towards the success of our synagogue, our Community and Israel. To each of your who has contributed to the accomplishments of our administration, I extend my warm and sincere gratitude. Together we have the satisfaction of knowing that our efforts have been responsible for the present success enjoyed by our Sisterhood. Just as Woman herself is ordained to become the helpmate of Man, so has the Sisterhood been the helpmate of the Congregation. Fifty years ago, the Congregation in its struggle for early existence, had the cares and woes that beset every such new group in its task of creating the physical and material means that must first be established to fulfill the spiritual requirements of the community. So for the many necessary tasks that the men of the Congregation could not perform, the Ladies’ Aid Society filled the breach. The name was more than a mere symbol–it was aid to the poor, to the sick, to the homeless and hungry that endowed meaning to the term “Ladies’ Aid”. And with it all, their efforts, in a day when the physical demands on their time and strength were much greater than now, they bent to their tasks with a nobility, with simplicity and many times anonymously–truly Hebrew Ladies. We today, men and women alike, might well emulate this zeal and vigor, and certainly the Congregation itself in order to prosper, hope and wish that the Sisterhood will continue its vital role in our community. For fifth years, the Rodef Shalom Sisterhood women have turned their talents for organization, communal endeavor and hard work to building a better Synagogue, a happier Jewish community, a sound Jewish education for their children and a deeper interest in their religion. The Scriptures say that “The Wisdom of Woman Builds a House”. And Rodef Shalom is greatly indebted to its Sisterhood women for the honest toil and good faith they have contributed to help make this a better, stronger Congregation. May Sisterhood find added strength in the years to come to continue its constructive activity. 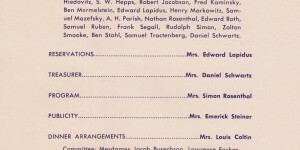 Committee: Mesdames Ralph Grinberg, Irwin Gross, Harold Hiedovitz, S.W. Hepps, Robert Jacobson, Fred Kaminsky, Ben Mermelstein, Edward Lapidus, Henry Markowitz, Samuel Mazefsky, A.H. Parish, Nathan Rosenthal, Edward Roth, Samuel Ruben, Frank Segall, Rudolph Simon, Zolton Smooke, Ben Stahl, Samuel Trachtenberg, Daniel Schwartz. Committee: Mesdames Jacob Burechson, Lawrence Farkas, J. Green, Joseph Hiedovitz, Henry Markowitz, Ben Mermelstein, Louis Perlstein, Daniel Schwartz, Harry Seiavitch, Zolton Smooke, Herbert Solomon, Bernard Stein, harry Weinberger, Sam Zuckerman. Committee: Mesdames Edward Green, George Hursh, Samuel Ruben. Committee: Mesdames Helen Handelsman, Lawrence Farkas, Norma Fisher, Edward Reese. Cast: Mesdames Samuel Mazefsky, Daniel Schwartz, Morton Keisel, Louis Coltin, Irwin Gross, Howard Harris, Edward Lapidus, Ben Mermelstein, Nathan Rosenthal, Samuel Rubin, Ernest K. Schwartz, Frank Segall, Michael Stoffa, Bertha Wander, Miss Ellen Burechson, Mrs. A. Schwadron.